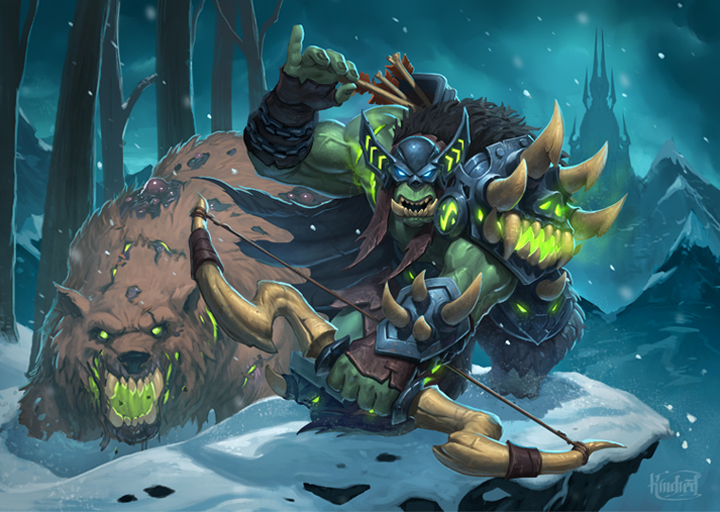 Deathstalker Rexxar was the first Hero card revealed from Hearthstone’s Knights of the Frozen Throne expansion. Early interpretation of the card placed it as an anti-control tool, giving Hunter infinite minions to run any control deck out of resources. However, in actual gameplay, Deathstalker Rexxar is a better tool against aggro than it is against control. Let’s explore this in a bit more detail! 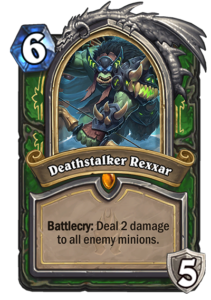 Deathstalker Rexxar is a Legendary Hunter class card from Knights of the Frozen Throne expansion. It is a six-mana Hero card that gives you five Armor and deals two damage to all enemy minions when played. It also replaces your Hero Power with Build-a-Beast, a two-mana Hero Power that allows you to craft custom Zombeast minions. I have explored the details of the card in full over at Hearthhead, so if you’re interested in exactly what kind of Beasts you can build, head over to that site. In some ways, the card seems to serve a dual purpose. Gaining Armor and dealing area-of-effect damage are defensive measures, and losing the Hunter Hero Power reduces your damage-dealing ability, but on the other hand an endless supply of minions should be good against control decks. In practice, however, that endless supply of minions is not as impressive as it first seems. Most control decks in Hearthstone right now are not trying to go for fatigue. Instead, they have powerful late-game win conditions of their own: Kazakus Priest machine guns you down with their free Anduin Hero Power after playing the Anduin and Raza combo, Control Warlock resummons a boardful of powerful demons with Gul’Dan, and Jade Druid just creates infinite, growing Jade Golems, and so on. Getting a Beast minion for two mana (the cost of the Hero Power is not even discounted from the final cost of the minion – this is no Primordial Glyph) is generally not enough to deal with the extremely potent swing turns available to control decks in the late game. Because Hunter lacks board clears, there is simply no response to a swing turn. Replacing the face-damage Hero Power with a minion-creating Hero Power – Who is the beatdown? The Hunter Hero Power deserves a bit more elaboration. It is the Hero Power of the beatdown deck. It does nothing else than damage to the opponent’s Hero, and therefore it is mostly useful for the more aggressive deck: the more aggressive deck in a game needs to end the game faster and does not bother to control the board. However, while Hunter used to be the beatdown, the sheer aggression of decks such as Aggro Druid and Pirate Warrior puts most Hunter decks on the defense: Hunter cannot race them even with the Hero Power. Well, if you’re not the beatdown as Hunter, why not change your Hero Power? Deathstalker Rexxar allows you to do exactly that, and it also gives you a fairly defensive Hero Power at that. The most common ability of a Zombeast is Taunt. You are offered at last one Taunt option 58% of the time when creating Zombeasts in Standard format. That’s a lot of defensive power! Hunter is no longer the most aggressive deck in the game. Perhaps a viable Face Hunter list can be built (Bearshark, I’m looking at you), but for the most part, Midrange Hunter finds itself playing the control role against more aggressive decks on regular basis. Deathstalker Rexxar is a key card that allows Midrange Hunter to assume this control role more naturally and find wins against aggressive decks. Deathstalker Rexxar can sometimes help against control decks as well, but the Zombeasts with their low tempo (you need to spend two mana to create each card) are not best suited for offense. Sometimes you just need more resources at any cost to carry on, and Deathstalker Rexxar gives you things to play at least, but against control it is usually the start of a slow fall behind in tempo and the eventual loss. Against aggro, however, Deathstalker Rexxar allows you to transition to a control role and use that role more effectively to win the game. Previous Previous post: Ultimate Infestation Jade Druid has a weakness!